Since 2006 museum gugging has been presenting the oeuvre of the Gugging Artists, who have counted amongst the most important protagonists of Art Brut since the 1970s. Their works form the foundation of the museum and document the key positions in artistic production in Gugging. The classics of Art Brut were and are represented in large retrospectives as well: for example, Adolf Wölfli, Aloïse Corbaz, August Walla, Johann Hauser, but also autodidacts like Gaston Chaissac or Sava Sekulic. Another major highlight was the exhibition of Jean Dubuffet’s first Art Brut collection, as it directly reveals the origins of Dubuffet’s thoughts on Art Brut. museum gugging has an exhibition surface area of 1300 m². Since 2009 the museum is supported by Niederösterreichische Kulturwirtschaft. galerie gugging was founded in 1994 and collaborates with galleries, museums, and collectors around the world. It is the “ambassador” for the Gugging Artists, who have counted amongst the most important representatives of Art Brut since decades. galerie gugging is a hotspot for the Art Brut scene and a place that has always been visited by artists, collectors, and the art affine as a source of inspiration. It presents and sells works by the Gugging Artists who own the gallery. Furthermore, it also represents international positions and as well as autodidacts and contemporary artists with parallels to Art Brut. atelier gugging exists since 2001. It is an open studio for anyone who wants to try out their skills in the arts. As years of experience at the House of Artists have shown, it doesn’t demand any specific quality standards or artistic know-how. The point is to work unencumbered, experiment with new ideas, and bravely develop one’s own personal formal language. Here, the Gugging Artists have worked in a friendly atmosphere side-by-side with creative guests from Austria and abroad. The House of Artists is the origin of art from Gugging. Since 1981 it has been the residence of the Gugging Artists. The House of Artists is an artwork in itself: The façade is furnished with murals by internationally renowned Gugging Artists such as Oswald Tschirtner, August Walla, Johann Garber, Philipp Schöpke, and others. Inside, one will find the room of the universal artist August Walla, which is covered with paintings from floor to ceiling, the workshop of Johann Garber, and the living spaces of the Gugging Artists. The House of Artists is an artwork, a historical document, and a testimony to appropriation in one. The House of Artists is a social welfare institution where the needs of artistically talented people are professionally supervised and they can live and develop their talents in their studios. 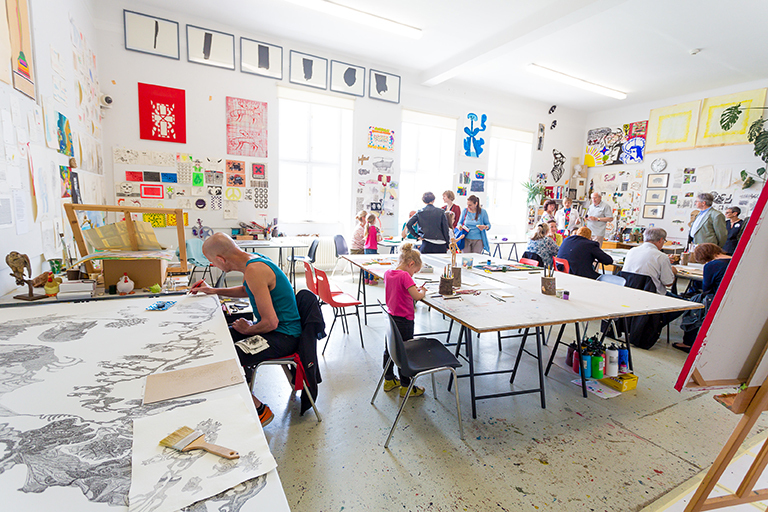 The Private Foundation – Gugging Artists was founded in 2003 by the legal representatives of the Artists from Gugging and the Friends of the Gugging House of Artists association with support from the Provincial Government of Lower Austria. The main objective of the foundation is to develop a major collection of important artworks by Gugging Artists and Art Brut in general. The artworks of the collection are lent for display at museum gugging, for presentation in temporary exhibitions at international museums, and are sent on tour. Furthermore, the collection is used for international presentations of the exhibition department of the Friends of the Gugging House of Artists association. Friends of the Gugging House of Artists was founded in 1990 as a non-profit association. The main focus of the association is to support and facilitate the work of Art Brut artists. Moreover, it aims to strengthen the position of Art Brut artists in the greater art world and events. Association members receive a special gift each year: an etching by a Gugging Artist! Other benefits are free entrance to museum gugging and discounts in the museum shop. A department of the association is responsible for organising international exhibitions of the Gugging Artists.